With Low-volume production are widely used in various machining industries. More and more new design and products fast& greatly enter into our marketing, and increasing speed of the product development and improving time-to-market are a constant struggle for every supplier. As one cnc machined manufacturer, we not only need to keep the quality of the parts, but also need to effectively control the production costs. Also, how to do quality inspection for your CNC machined manufacturing, this is key points, Creatingway will take this blog to sharing these. How does high effectively production keep manufacturers competitive? No matter you’re a businessman or manufacturer, no matter what industries you’re in work. Such as: Aerospace, automotive, medical devices or consumer electronics industries etc. Our aim is how to reduce the whole production costs and decrease production time to ensure the new design and parts quickly to market, thus obtain the maximum benefits. As one company want to achieve this goal, it will mean that the whole production workflow- from machining to delivery. We need to strictly control the whole production cycles, machining processes and production time and ensure without any errors, and provide high quality of the parts and effective delivery time to meet our customer requirements. In addition to this, the part inspection is essential before shipment. Based on this point, 3D printing make full use of its advantages: accurately, quickly and precision to meet customer requirements. And with 3D scanning and measurement technology fast development, 3D printing has rapidly occupied the prototype position in CNC machining industries. When one part is finished, we need to careful scanning/inspection it before shipment, have a look whether it is perfectly and meet our customer requirements. By the human eyes to inspect it, maybe it will have a little errors; but by 3D printing equipment, you only need to click one button-3D scanning and inspection system, it will automated 3D scanning and inspection for the production parts, no need extra operation and programming. At the same time, by 3D scanning technology application, it can suppress the deformations in the surface characteristics of the parts under inspection, thus make we’re able to deliver more precision 3D scan data. Once generated, this report will be able to provide the fully data to compare with CAD model, including in full geometric dimension and tolerance measurement information. This is essential for the parts analysis before production. 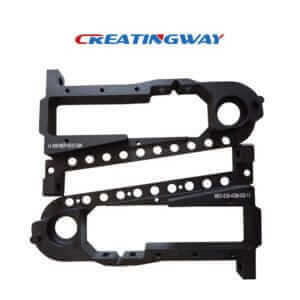 With CNC machining comparing, it not only can fast and effective printing some part, but also can guarantee the product high quality without any errors. In general, one simply 3D prototype, it only need to take several hours or one day to complete quickly. For CNC machined manufacturing prototypes, firstly we need to check whether it can be machined on the CNC without any modification. If ok, it will start to program and produce them, this will take 1-2 days. But for some complicated designs and geometric shape of the parts, we need to further discuss with our customers before production, it will also take at least 1-2 day. Once the design is confirmed, we will start to programming and producing them on the CNC, this will take 2-3 days. As a whole, CNC machining will take more time than 3D printing, so the whole production costs is higher than 3D printing.